This new (2016) ITIL Practitioner qualification takes an entirely new approach to service management education and training. It focuses on the “HOW to make service management happen” rather than the detail of “WHAT service management processes do”. 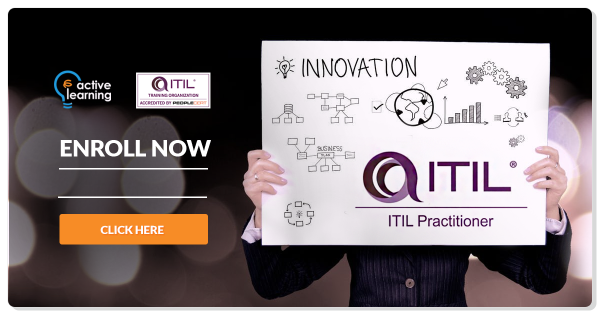 The course offers practical guidance on how to “adopt and adapt” the ITIL framework to support your organization’s business objectives.As such it is the missing link in the ITIL qualification portfolio. The course addresses the practical issues of: gaining management support, bringing about the cultural change and ensuring that best practice adds real and measurable value to the organization. ITIL® is a registered trademark of AXELOS Limited. Used under license of AXELOS Limited. All rights reserved. Candidates must hold the ITIL Foundation Certificate (gained since 2007) and should have a minimum of three years’ experience of working in a service management role. The official publication “ITIL Practitioner Guidance” accompanies the qualification and must be studied prior to course attendance. The examination is open book and made up of multiple choice questions based on a scenario. Students will be allowed 105 minutes to answer the questions. You need at least 70% (28/40 points) to pass.